Q Do inhaled corticosteroids increase the risk of pneumonia? And if so, by how much? A Inhaled corticosteroids (ICS) for COPD increase the relative risk of any pneumonia by approximately 60% and a serious pneumonia by 71%. Based on a meta- analysis of 16 trials, the number needed to harm is 47; that is, treating 47 patients with an ICS is likely to cause 1 extra pneumonia. Older patients, those with more severe disease,and those with a low BMI appear to be more at risk of developing pneumonia. However, inhaled corticosteroids do not appear to increase the pneumonia related or all- cause mortality. 1 There is no robust evidence to suggest that any particular steroid has an increased risk over another. A Cochrane review of ICS demonstrated a reduction in the rate of exacerbations (-0.26 exacerbations per patient per year) and a reduction in the rate of decline in quality of life. 2 Given that exacerbations are a more common occurrence, the benefit in reducing their frequency is likely to outweigh the increased risk of pneumonia. However, the balance should be considered for each patient, and those with recurrent or serious pneumonias may require careful consideration. Q In what circumstances would you recommend surgery for COPD? A There are currently two surgical options for patients with COPD. Lung transplantation may be considered in younger patients (generally <65 years) with severe disease (FEV1 <20% and/or TLCO <20% predicted) and no contra-indications, such as ongoing smoking, significant heart, kidney or liver disease or osteoporosis. However, the morbidity from surgery and ongoing immunosuppression is significant and there is a lack of available organs. 3 Lung volume reduction surgery for patients with significant hyperinflation improves symptoms, exercise capacity, quality of life and, in some patients, even life expectancy. 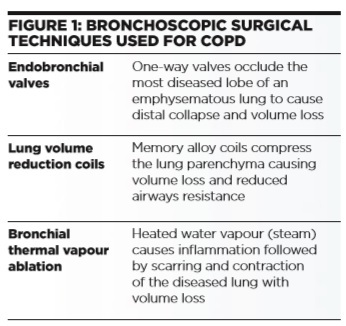 4 Newer bronchoscopic techniques are in development and include placement of endobronchial valves, lung volume reduction coils or treatment with thermal vapour ablation (see figure 1). When considering a surgical procedure for COPD it is important that patients have received maximal medical therapy including smoking cessation and pulmonary rehabilitation. Q How useful is the BODE index in terms of predicting prognosis in COPD? A The BODE index combines several measurements (BMI, severity of airways obstruction, dyspnoea and exercise capacity) to predict mortality in COPD. Severity of airway obstruction is calculated from FEV1 % predicted, dyspnoea rating uses the mMRC, while exercise capacity is measured using the six minute walk test. Each variable is given a score of 0-3 (0-1 for BMI) based on how severe it is. This can be converted into a risk of mortality up to 52 months with higher scores predicting worse mortality. BODE index calculators are widely available online and through medical calculation applications (e.g. www.qxmd.com/calculate-online/respirology/bode-index). This allows clinicians to estimate the risk of dying in the coming years 4 and helps inform discussions regarding prognosis and treatment. The BODE index has also proven useful as a predictor of hospitalisation and is amenable to change with treatments such as pulmonary rehabilitation and lung volume reduction surgery. Q Is it unusual to see COPD in non- smokers? A No. In a UK study of patients with spirometrically defined COPD, 15% were never smokers. 6 Chronic obstructive pulmonary disease refers to poorly reversible airflow obstruction. This commonly results from smoking, but other insults that cause inflammation in the lung may include exposure to biomass fuels and industrial dusts such as coal dust. 7,8 In addition, fixed airflow obstruction on spirometry may be seen in a variety of other diseases, including chronic asthma, bronchiectasis and sarcoidosis. Thus, it is important to consider symptoms and signs that may suggest another disease process. Finally, many elderly patients will have mildly obstructive spirometry without symptoms or a significant smoking history. 9 This decline in lung function with age is a normal process and should not lead to a diagnostic label of COPD alone. This should be reserved for patients with symptoms and risk factors for COPD in the presence of obstructive spirometry. Q How useful is pulmonary rehabilitation and how often should it be repeated? A Pulmonary rehabilitation is a multidimensional programme comprising supervised aerobic exercise, resistance training and education. It is typically delivered as two supervised sessions and a further home session over 6-8 weeks. Following this, patients are encouraged to continue exercise at home. It provides significant improvements in exercise capacity, walking distance and symptoms of breathlessness, anxiety and depression. It should be considered in all COPD patients with an MRC score >2 who are limited by breathlessness and do not have contra-indications such as unstable cardiac disease or who are housebound. Repeat pulmonary rehabilitation should be considered after a year, or earlier, in those with a significant deterioration in their exercise tolerance. 10 However, access to local programmes may be limited, and encouragement of self maintenance is important. Q Should patients have an advance supply of antibiotics/ steroids for prompt self-treatment in an exacerbation of COPD? A The evidence of self-treatment of exacerbations in COPD is unclear. Studies examining the effect of self-management usually include a mixture of interventions including education, exercise, telemonitoring and self-treatment. Thus it is difficult to pick out which individual intervention is making a difference. In a Cochrane review of self-management there was a reduction in hospital visits for patients undertaking self-management. 11 However, a review examining the effect of self-action plans (including self-medication) with only brief or no educational intervention showed no change in healthcare utilisation or quality of life. 12 Individual studies have shown that self-treatment often leads to an increase in steroid and antibiotic use. 13 Thus when deciding on whether a patient is suitable for self-treatment it is important to consider a patient’s motivation to self-manage and the ease of access to healthcare professionals who can provide ongoing education and support. Dr Omar Usmani is a recipient of a UK National Institute for Health Research (NIHR) Career Development Fellowship. Both authors are supported by the National Institute for Health Research (NIHR) Respiratory Disease Biomedical Research Unit at the Royal Brompton and Harefield NHS Foundation Trust and Imperial College London. 1. Singh S, Amin A, Loke Y. Arch Intern Med. 2009 Feb 9;169(3):219–29. 2. Yang I, Fong K, Sim E, et al. Cochrane Database Syst Rev. 2009;(7). 3. Orens J, Estenne M, Arcasoy S, et al. J Heart Lung Transplant. 2006 Jul;25(7):745–55. 4. Fishman A, Martinez F, Naunheim K, et al. N Engl J Med. 2003;348(21):2059–73. 5. Celli B, Cote C, Marin J, et al. N Engl J Med. 2004;350(10):1005–12. 6. Shahab L, Jarvis MJ, Britton J, West R. Thorax. 2006 Dec 1;61(12):1043–7. 7. Po J, FitzGerald J, Carlsten C. Thorax. 2011 Mar;66(3):232–9. 8. Balmes J. J Occup Environ Med. 2005 Feb;47(2):154–60. 9. Roberts S, Farber M, Knox K, et al. Chest. 2006 Jul;130(1):200–6. 10. Bolton C, Bevan-Smith E, Blakey J, et al. Thorax. 2013 Sep 1;68(Suppl 2):ii1–ii30. 13. Monninkhof E, Valk P van der, Palen J van der, et al. Thorax. 2003 May 1;58(5):394–8.